Rinse beans, picking out any bad ones. Cover with water so there is a couple of inches of water over the top of the beans; soak overnight. Drain and add 4-5 cups water (enough to cover beans) in a large soup pot. Bring to quick boil over high heat. Reduce heat and add remaining ingredients. If soup bone is not mostly covered with water add a little more. 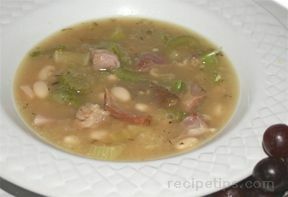 Bring soup back to a boil and then reduce heat to low; cover and simmer for 2 1/2 hours, until beans are very tender. 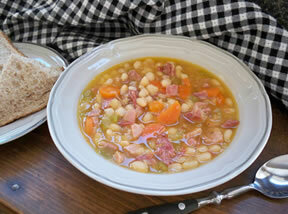 When beans are tender, remove the soup bone and cut off any meat and add back into the soup. 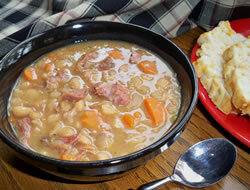 If you have additional leftover ham, some can be added to the soup to provide a little more meat to the soup if desired. If mixture appears too thick, add a little boiling water. SLOW COOKER: Use basically the same directions only after bringing the beans to a quick boil, pour them and the water into the slow cooker. Add all the remaining ingredients, cover and turn slow cooker on low. Cook for 10 hours or until beans are tender. To speed cooking time you can cook on high for the first hour and then turn down to low and cook for 7 hours. Note: A small amount of baking soda added to the soup during cooking will reduce the amount of gas in the beans. 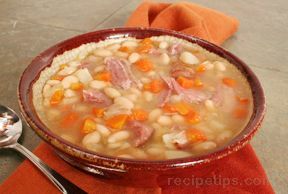 "This was one of the best ham and bean soups I have tried. I made it in the crock pot and it was super easy and it had such a good taste. Usually I have to add some type of flavoring but I didn't have to add anything more than the recipe called for. The next time I have a ham bone I will be making this again."